Horses come to Akindale from a variety of venues. Some come from low-end auctions, others are transfers from organizations such as Mid-Atlantic Horse Rescue. Currently, Akindale’s facilities are in such high demand that preference is given to adoptable horses so space can be made for other at-risk horses. When a horse is admitted to ATBR’s program, he or she is first seen by a vet, an equine chiropractor and a dentist. Health status is the primary checkpoint in determining readiness for training. 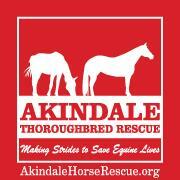 Akindale’s robust training program, directed by Heather Carlson, works to re-establish trust with the horses. After 30 days of under-saddle training in a variety of conditions, Carlson reevaluates each horse to decide whether he or she is ready for adoption. By investing an extensive amount of time and energy into their training program, Akindale thoroughly prepares their adoptable Thoroughbreds for new career. Pfister says, ATBR’s rescue and retraining program is remarkable because of its broad capabilities. Its impressive size and resource pool make it possible for ATBR to treat horses that cannot be helped elsewhere. One graduate of ATBR’s successful training program is Stud Muffin, a retired crowd-favorite. He arrived at Akindale in 2012, after a long racing career. Carlson took a special interest in Stud Muffin and helped him flourish. They successfully competed in the Retired Racehorse Project’s Thoroughbred Makeover together at Pimlico racetrack in 2013. Stud Muffin and Carlson’s bond was undeniable and after that pivotal experience together, the two were inseparable so she adopted him. TCA’s grants are primarily ear-marked for horse care and medical expenses. When a horse is brought to the rescue with little or no paperwork, the ATBR team works to determine the horse’s medical history as well as identify any ongoing problems. Pfister’s goal for the future of the aftercare industry is to increase the required amount of paperwork for retired racehorses as understanding preexisting conditions and experiences would save on exploratory veterinary examinations and procedures.